An insurance policy is essentially a contract between you and your insurance company – it lays out what’s covered, what isn’t, and other details of your agreement. An insurance policy – also called a contract of adhesion (yeah, like glue) because you agree to stick to the contract terms and conditions – is an agreement between you and your insurer outlining the coverage they’ll provide you, others in the policy, your stuff, and your place. After you sign up and pay for your policy (yay! ), you’ll receive your personalized insurance policy in your mailbox, or, in some cases, your inbox. Open it up, and you’ll see all of the ins and outs of your insurance agreement. It’s probably a good idea to check out exactly what is covered under your renters or homeowners insurance policy so you’ll understand when you can and cannot use it. For example: say bad weather causes flooding and you want to file a claim… unfortunately you’ll be out of luck as no policy – homeowners, renters, or condo/coop – covers flooding. Alternatively, say there was a short circuit and your place catches fire destroying your stuff – you can file away as damage due to fire is covered on both policy types. All coverage deets can be found under the ‘property coverages’ section. And if you’re looking to see the total worth of the stuff you’re covering, you can find that information on your Declarations Page (honest… that’s what it’s called), which is typically found on the first page of your policy. You can also learn more about the breakdown of your premium, as well as your deductible, and the total duration of your coverage. As with most legal contracts, insurance policies can be a bit difficult to read. If you take a look at your policy, you’ll see that it’s full of confusing exceptions, and Middle English words like ‘pewterware’ and ‘smudging.’ This can make it pretty hard to understand what’s covered under your insurance policy. 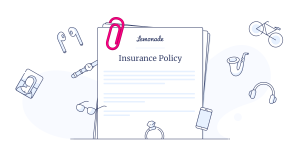 Here at Lemonade HQ, we took a swing at making insurance policies easier to understand by creating Policy 2.0, the world’s first open source insurance policy. It’s free of crazy words and page jumps, and is a much shorter read (10 pages!). You’re welcome to check it out, and even give your feedback here.